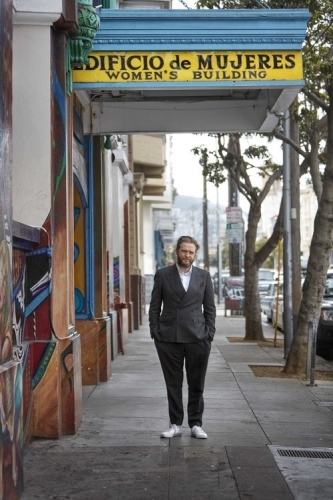 Ragnar Kjartansson commission "Romantic Songs of the Patriarchy"
MAESTRAPEACE Mural, The San Francisco Women's Building. Photograph by Quinn Gravier. C Project's inaugural event, Ragnar Kjartansson's Romantic Songs of the Patriarchy is a three-day durational musical performance that will be staged throughout the spaces of the Women’s Building in the Mission District of San Francisco on November 9, 10th and 11th, 2018. The audience will encounter musicians performing familiar and what at first appear to be innocuous love songs but, when listened to more carefully, reveal more complex and often more disturbing attitudes. It is a humorous, poetic reflection on the state of our culture in the midst of the great turbulence called our times. The project is curated by Tom Eccles, Executive Director of the Center for Curatorial Studies at Bard College. Timed tickets will be free to the public and will be available on Eventbrite on September 5, 2018. For more information, please visit C Project's website.